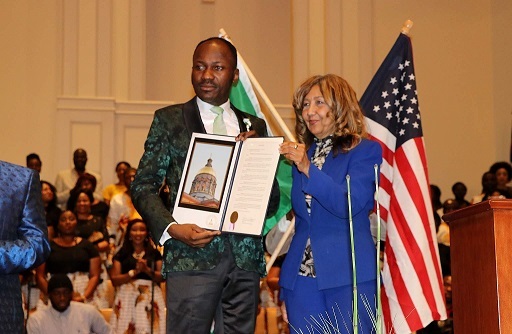 Apostle Johnson Suleman Receives ‘Key to the City’ From Mayor of Atlanta, Awarded Doctorate Degree in US –Nigeria’s firebrand cleric, Apostle Johnson Suleman, has received the key to the city from the Mayor of Atlanta in the USA. 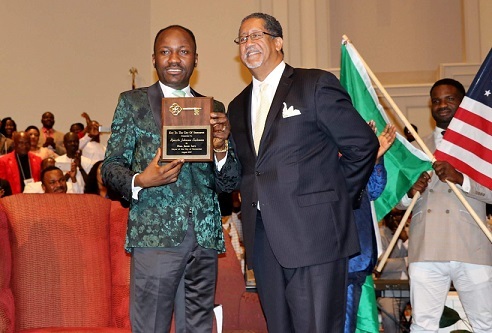 Apostle Johnson Suleman, the General Overseer of the Omega Fire Ministries Worldwide, has received the key to the city of Stonecrest in Atlanta, Georgia, confirming him a recipient of the highest honour to be given by the state. According to Vanguard, the key to the city was presented by the Mayor, Hon Jason Lary at a colourful ceremony at Big Miller Grove Missionary Baptist Church, Lithonia, GA, venue of the church’s ongoing crusade and attracted personalities from across several states in America, including members of the legislative and executive arms of government. Hon Lary, in the presentation, acknowledged Apostle Suleman’s compassion and contribution to the plight of the downtrodden and less privileged, a fact which made him entitled to the key, clearly the highest honour to be bestowed on an individual by the city. 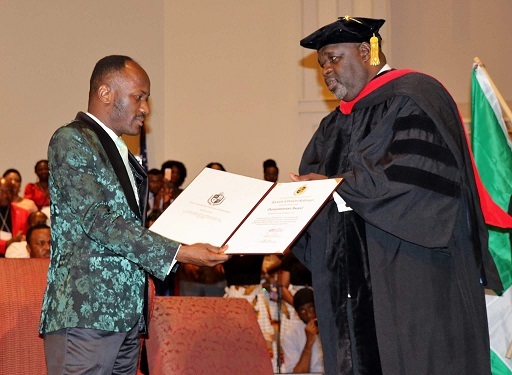 The fiery preacher was also a recipient of a Humanitarian Award and Honorary Doctorate Degree by the Trinity International University of Ambassadors, USA an event which elicited positive responses from dignitaries present. President of the university, Dr Jacqueline Mohair, while presenting the Humanitarian Award, described the General Overseer of Omega Fire Ministries as a “humanist with a heart of gold”, noting that his selfless services go ahead of him. 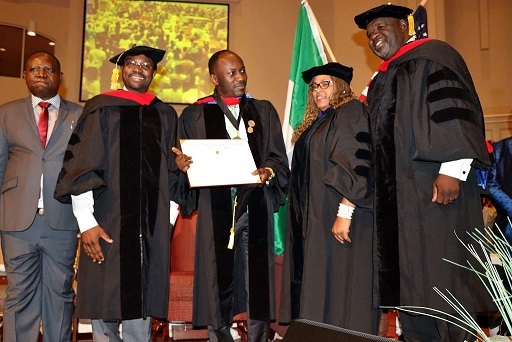 On the other hand, Dr Glen Jones, Vice President of the Trinity International University of Ambassadors who decorated and presented Apostle Suleman with Honorary Doctorate Degree of Divinity said the varsity was very pleased with the senior pastor, adding that there was no doubt that the award would propel him to greater exploits. Highpoint of Tuesday’s outing was the large turnout of people for the crusade in Stonecrest late in the evening which resulted in many giving their lives to Jesus Christ as Saviour and the healing of the sick, including several who abandoned their wheelchairs. The preacher later visited the famous Woolworths Lunch Counter Sit-ins and The Center for Civil & Human Rights Museum Georgia. He was conducted round the facilities by His host, Martin Luther King Jnr III. In a statement, his communications manager, Phrank Shaibu stated that it was noteworthy that the awards were unsolicited and took place in the United States where integrity and selfless services are rewarded. He assured members of the church as well as admirers worldwide of the unflinching commitment of Apostle Suleman to the redemption of souls, healing, deliverance from satanic oppression and breakthrough in all spheres of life.